Thanks to Sky, who held a screening of “Olive Kitteridge” during the Viennale, I had the chance to see this HBO mini-series all in one go, for free, and on the big screen. The only drawback was that the screening took place in the afternoon on a weekday, thus I had to take the day off. However, “Olive Kitteridge” was totally worth it. I don’t know the short novel this is based on, so I can’t compare the two, but I really liked the mini-series. It offered a wonderful, complex and multi-layered portrait of a woman, and deals with difficult topics like depression and mental illness. Despite the fact that Olive can be quite stern and harsh, she never crossed a line that would make her unlikable for me. Granted, she’s not an easy person, and as far as identifying yourself with the protagonists goes, I definitely found more of myself in her ever-friendly, helpful, understanding and kind husband Henry than in her, but that doesn’t mean that I couldn’t sympathize with her. The fact that she’s just as harsh on herself as she is on the rest of the world definitely helped with that. I also really loved the more humorous scenes. While most of “Olive Kitteridge” is a rather serious and somber affair, there are also some lighter moments, especially at the wedding in episode 2, and I loved them all. Which is not to say that I didn’t also appreciate the more sad and depressing moments, but it was nice to get a little fun here and there. I also loved the fact that the mini-series takes place over the course of a couple of decades. The story was very engaging, the dialogues very well written, and the sadder moments worked just as well for me as the funny ones. It’s also extremely well cast. I can’t imagine Olive Kitteridge played by anyone else than Francis McDormand, who gives an absolutely stunning performance. The rest of the cast is great too, with Richard Jenkins, Zoe Kazan and John Gallagher Jr. particular standouts. I also quite enjoyed Bill Murray (they really let us wait for him, by the way; after showing up for two seconds in episode 3, it’s not before the fourth and final episode that he gets a bigger role), even though he pretty much plays his regular grumpy and cynimal old man; but at least he does it well. I also loved Lisa Cholodenko’s direction. Some of the landscape shots were especially beautiful, and there are a couple of wonderfully staged scenes. The pacing is also great, finding the right balance between moving the story forward and staying in the moments long enough for us to enjoy them. My only complaint is the hostage situation. I get that it served as a means to escalate the story, and to bring some long-hidden truths and feelings to the surface, but it still felt too overly dramatic to me, and didn’t really fit with the rest of the miniseries. 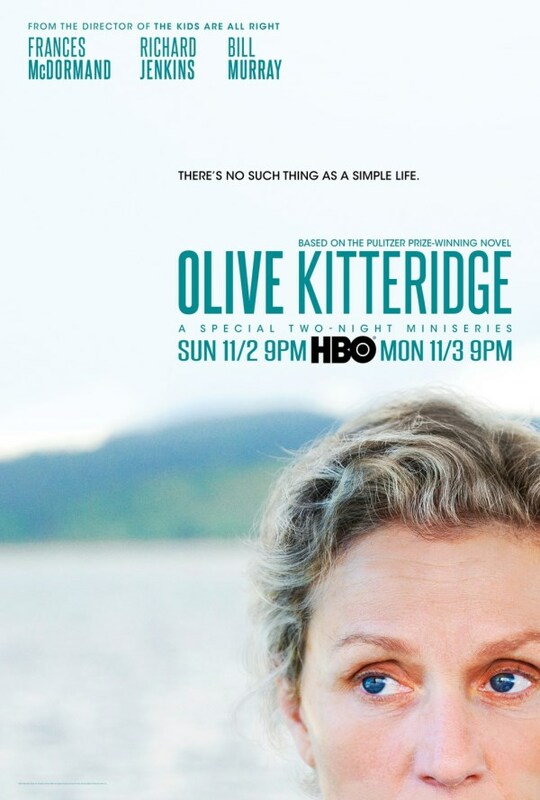 Apart from that, however, “Olive Kitteridge” was absolutely great. This entry was posted in cinema 2014, movie reviews, Viennale and tagged Frances McDormand, HBO, Olive Kitteridge, Viennale 2014. Bookmark the permalink.